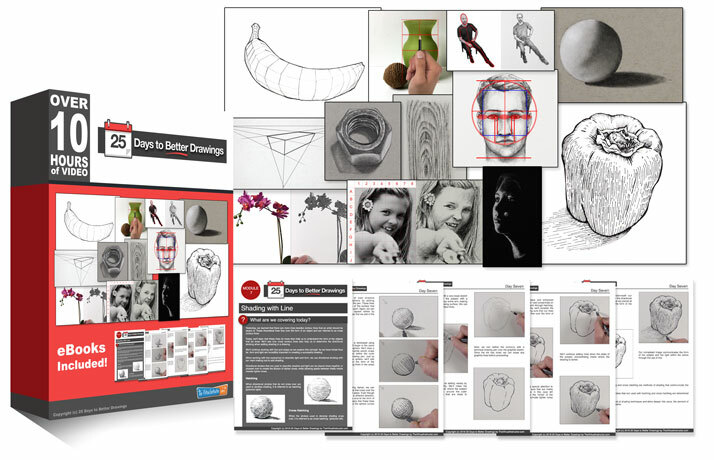 Description: Learn how to draw complex subjects by piecing together simple, basic forms. Suggested Materials: Graphite drawing pencils: H, HB, and 2B, white drawing paper, and a kneaded eraser. Is this like creating a grid of say, a square and a triangle, to slot the pieces in? (I can’t “see” the cube, but I can see the square). This approach is about simplifying the subject down into basic forms instead of shapes. Forms are 3D and shapes are 2D. We covered drawing with shapes on Day 4 (https://thevirtualinstructor.com/members/25-days-to-better-drawings-day-four-drawing-with-shapes/). Most subjects can be simplified into basic shapes, but some find it easier and many times – more accurate, to think of forms instead of shapes. For example, instead of simplifying a subject with a square (shape), you may draw a cube (form) instead. Golly, that’s great. I wish you would demo a skull defining the shapes … personally I think it might be an easier approach on a skull than the three forms imagined? You can use shapes if you prefer. This module is just illustrating a different approach using forms.